The region Poitou-Charentes in mid-west France is a zone where several geographical entities meet. Almost devoid of relief, it benefits from a distinctly oceanic climate, practically mediterranean in type in the area of the Saintonge. The islands and channels of the littoral fringe add to the particular character of the countryside resulting in a rich and diverse fauna and flora. 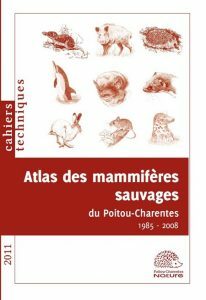 This « Atlas des mammifères sauvages du Poitou-Charentes » (Atlas of the wild mammals of the Poitou-Charentes), is the first synthesis on the subject, published under the auspices of the association ‘Poitou-Charentes Nature’. In addition to the monographs covering the distribution, ecology, evolution and conservation status of the 96 species observed in the region between 1985 and 2008, the conservation of terrestrial and marine mammals and the management of their habitats are discussed. With the participation of 750 contributors who have provided nearly 50,000 records, ‘l’atlas des mammifères sauvages du Poitou-Charentes’ will become the major reference for the mammalian fauna of this region and of western France. 21 x 29,7 cm, with its 304 pages, more than 100 illustrations, this writing can be bought for € 24,00 (+ shipping).